I actually tried it for a few minutes and I didn’t notice a speed increase worth the trouble of not seeing my updates right away. YMMV. Max is a free and open source (GPL) OS X application for creating high-quality audio files in various formats (including FLAC), from compact discs or files. I remember seeing this in a bookstore years ago, but I didn’t buy it. Well, now it’s free for download. Mildly amusing. Some of the critiques are still true; others have long been addressed or are no longer relevant (do people think X is a “disaster” because it’s a resource hog?) and then a bunch of the book is simply humor and trivia. For all it’s warts, I love UNIX/GNU/Linux and it’s the best choice out there for me. Plan 9 is certainly not going to replace it, at least for me. I thought it might be interesting to check out the Plan 9 operating system, since it’s sort of the sequel to UNIX and is supposed to have cool new features (like better support for the “everything is a file” concept of UNIX). 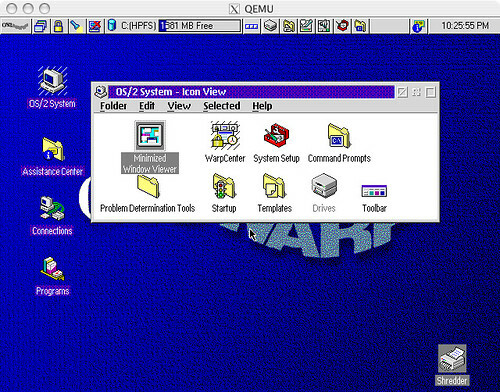 Luckily, you can download an ISO file for a live/install CD, so I downloaded it and fired it up in QEMU…. Well, I just spent $1500 last month to fix my alternator and a few other things. Recently, a grinding sound became noticeable at idle so I took it to the shop and now they say it needs a new AC compressor for around $1000. Since the car is a 1995, I’m wondering whether to sink more money into it or to seriously look at replacing it with something newer. The other day I realized that often when I’m using touch, I’d like it to have the ability to create ancestor directories that don’t exist, a la mkdir -p. I quickly hacked together a shell script to do what I want. Well OS/2 does work in QEMU, though I guess you might say that I cheated a bit – I did this by doing the install in VMware Player and then using qemu-img to convert the file from a vmdk to a qcow.